Douglas Rushkoff, media theorist, writer, and graphic novelist, joins Dan and Lex for a conversation reflecting on the decade since he published his book Nothing Sacred: The Truth About Judaism, in which he advocated for "open source Judaism." Rushkoff argues that that 21st Century Judaism should be based on contemporary interpretations of the traditional pillars of iconoclasm, abstract monotheism, and social justice. To learn more about Douglas Rushkoff and his writings, you can visit his website by clicking here. To purchase Nothing Sacred, Rushkoff's book on contemporary Judaism, click here. 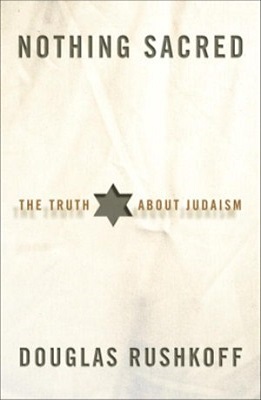 To hear more from Rushkoff about why Jews should avoid judging Judaism "by the numbers," read his 2002 piece in the New York Times on the subject. To read a short excerpt from Nothing Sacred about "lapsed Jews," click here. For more on Jewish Atheism, read this Haaretz article by Benjamin Cannon, entitled "You Don't Need to Believe in God to Believe in Judaism." Learn more about Rushkoff's other books and comics, including Testament, Open Source Democracy, and his most recent -- Throwing Rocks at the Google Bus -- by clicking here.